Sometimes cooking problems turn in to the opportunity for some kitchen creativity. When baking for the January Carroll Cafe, I got distracted and over-cooked my cornbread scallion muffins. They weren’t burnt, but they were definitely unattractively dark and therefore not suitable to sell. But I hated to waste all that food, so I got creative and came up with this delicious cornbread vegetable strata. I made this up, working with the ingredients I had on hand, so feel free to adjust based on your preferences or whatever needs using in your house. If you don’t want to make cornbread muffins, you can buy cornbread at the grocery store and add corn and scallions to the strata. In a large skillet, sauté onions and mushrooms in olive oil over medium heat, stirring occasionally until vegetables are golden. Preheat oven to 350°F. Grease a 9×13″ pan with cooking spray. Crumble the cornbread into the pan. 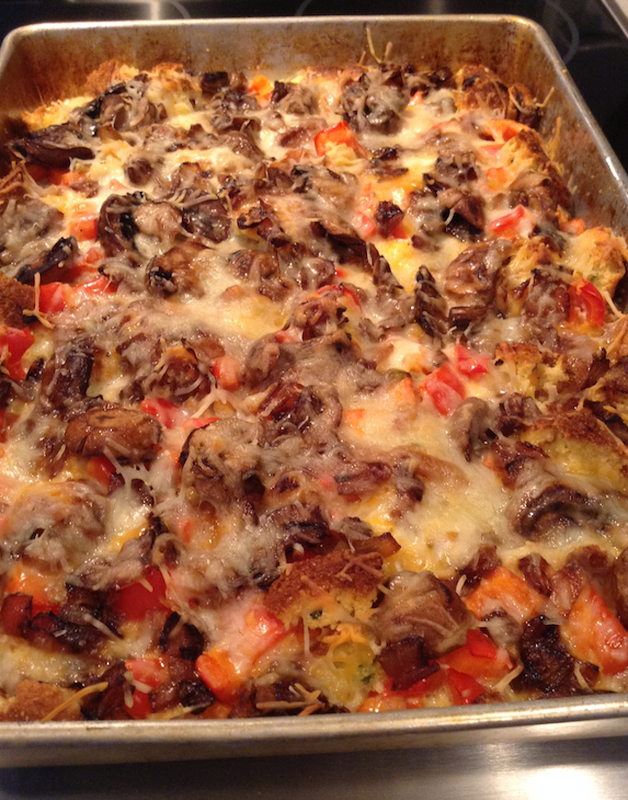 Top with bell peppers, 2 cups cheese, sautéed vegetables, and then the last cup of cheese. In a bowl, whisk together milk, eggs and seasoning. Pour liquid over the prepared strata. Bake for 30-40 minutes, or until the center is set. Let rest for about 5 minutes before serving.